Jirau hydroelectric power plant was constructed on the Madeira River, Brazil. Image courtesy of PAC 2. 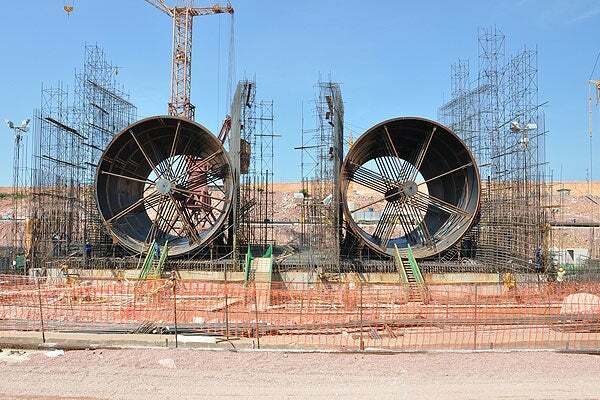 Construction of spillways underway at the Jirau power station. Image courtesy of PAC 2. The construction of Jirau hydroelectric plant was commenced in 2008. Image courtesy of PAC 2. Pouring of asphaltic core for the Jirau dam in progress. Image courtesy of Camargo Corrêa Engenharia e Construção. The Jirau hydroelectric project is a run-of-river power plant located on the Madeira River in Rondônia, Brazil. The first unit of the 3,750MW plant was commissioned in September 2013, while full commissioning of all units was achieved in 2016. It is the third biggest hydroelectric power plant in Brazil. The project was developed by Energia Sustentável do Brasil, a consortium of GDF SUEZ (40%), CHESF (20%), Eletrosul (20%) and Mitsui (20%). The project was initiated as part of the PAC-Growth Acceleration Program by the Brazilian Government. The plant provides power to approximately ten million houses, while offsetting approximately six million tonnes of CO2 emissions per annum. "The plant provides power to approximately ten million houses, while offsetting approximately six million tonnes of CO2." The Jirau run-of-river project consists of a 63m-tall asphalt core embankment dam with a 980m-long crest, 18 22.7m-high and 20m-wide spillways and two powerhouses on both sides of the Madeira River. It creates a reservoir area of 361.6km². The plant comprises 50-bulb hydro turbines with a head height of 30m. The turbines are suitable for run-of-river operation with low heads up to 30m. The power house on the right bank is equipped with 28-bulb type generating units, while the left bank comprises of 22 units. Each turbine has a nominal power output of 75MW and an average efficiency of 94.8%. The project is registered under the Clean Development Mechanism with The United Nations Framework Convention on Climate Change. The hydroelectric power plant construction was commenced in 2008. The earthworks were performed using Dynapac vibratory compactors, including a Brazilian-built CT 300 tamping roller. "Each turbine has a nominal power output of 75MW and an average efficiency of 94.8%." Two mobile MK-360 shoring towers and ENKOFORM HMK and VMK formwork were installed for the water intake. A form carrier with rolling system was used for the erection and dismantling. A step-up substation and three 94km-long 500kV transmission lines were commissioned in June 2013. The project provided 12,000 direct and 30,000 indirect jobs during the construction phase. The power output of the plant is supplied via three 500kV transmission lines to the Porto Velho collector substation. It is then transmitted to the Interconnected Grid System (IGS) via a new transmission line. The plant owner signed a 30-year power sale agreement with distribution companies that purchase 73% of the total power generated by the plant. The total cost of the project is $8bn. National Bank for Economic and Social Development (BNDES) provided approximately €3.6bn in financing, while the remaining was financed by a consortium of commercial banks. Intertechne Consultores was awarded the contract for the resettlement construction and reservoir deforestation. Camargo Correa was awarded the civil works contract. Alstom Hydro was awarded the contract for supplying ten turbines and 17 generators. The contractual scope also included supply of 28 speed governors, monitoring systems, bus bars and surge / neutral devices, as well as supervision of erection and commissioning of the machinery. Dong Fang was awarded the contract for supplying 18 bulb-type turbines of 75MW each. Ulma Construction was awarded the contract for providing the MK-360 shoring towers and ENKOFORM HMK and VMK formworks. Siemens was awarded the contract for providing the electromechanical equipment. Toshiba was contracted to construct three 500kV transmission lines from the plant to Porto Velho. Hyosung supplied 18 550kV high-voltage GIS switchgears for the project. The engineering works contract was awarded to Tractebel Engineering. Baguari hydropower plant, which is located on the Doce River in the state of Minas Gerais, Brazil, was inaugurated in October 2009.